Many artisans love making the Tree of Life pendant. It's a deeply meaningful symbol. However, every designer makes the Tree of Life differently. Some of the most outstanding examples are made by Shannon Williams of Vixen's Natural Jewelry on Etsy. Her passion for making Tree of Life pendants is such that these have become her signature pieces. She works with much thicker wire than most people do. 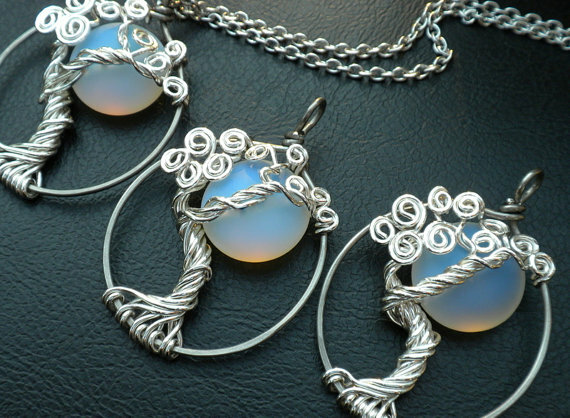 The addition of gemstone moons or suns and lovely metallic swirls make them uniquely hers. She also makes them with beaded branches and can customize with birthstones for family trees. Shown here are some of my favorites. Why does she like the Tree of Life so much? She explains, "The Tree of Life has many meanings. My favorite is that we are all connected. It is a Universal symbol found in many spiritual traditions around the world. It symbolizes life itself, with it's branches reaching for the Heavens, and it's buried roots, linking to Earth." "There is something magical about cutting wire off of a spool, and turning it into a sculpture. I usually sip on coffee, go outside to create. Sometimes I sit by the window and let my hands guide me. I intuitively listen to the wire. It will tell me where to twist and bend. I guess the best way to describe it is lining our will powers together in unison. It is a harmonious dance, very organic. During that time I feel alive and completely in the moment. My head and all it's chatter turns off, and I feel like I am connected. It is the best feeling ever. The end result is a pretty tree, with a deeper meaning." All her Tree of Life designs are beautifully made and it comes as no surprise to learn that she is very experienced as she has made at least a thousand of them! She adds, "My mood can really influence how they look. If I am feeling happy, they are whimsical. If I am sad, they usually have a lot of soul to them. If I am feeling devious they might be really gnarly. I love how they have their own personalities. I find my rhythm in nature, and am always inspired by it." While the Tree of Life is her favorite piece to make, it is not the only design style she does so do check out her store. If you'd like to win one of her fabulous designs, please make a comment below. Make sure you leave contact info if you do not have an online shop or blog. Extra entries if you become or are a blog subscriber or follower etc. If you also do shout outs about this giveaway, those will count as additional entries too! Shannon also has a Facebook Page. Please say so in the comments. It ends in a week's time at 6 pm EST Monday, April 30, 2012. I will pick a winner randomly and announce the results as soon as possible after. So be sure to leave a contact email if you don't have an online link or make sure you come back and check! Good luck! I too make tree of life pendants but mine use thinner wire and more strands. These trees by Shannon are outstanding. I love the simplicity of them, with the fewer wires they are more serene. I would love to win one of these. These are lovely. I especially like the amber sun/forest piece. Would love to win one of these! Thank you for the giveaway chance! You are right Pearl, these are outstanding examples. She has really excelled at her craft. I would be thrilled to win one of these! Thanks to both of you for the giveaway! I am already a Beading Gems follower. I am a follower :)! These versions are outstanding and I would love to receive one! I follow your blog and am a Facebook fan. These Trees are sublime!!! My favourite is the moonstone one. I can understand why she love the Tree of Life symbolism, it is mine as well. However, these designs are the most beautiful ones I've seen created. Wish I lived closer, I would love to take a workshop or two, or three, or four, with her. Beautiful interpretation of the tree of life. Love the addition of stones! I have seen a lot of different tree-of-life designs but these top most of them. I love the one with the Opalite moon. I'm intrigued by the meaning of Tree of Life which you have interpreted very nicely. Love the gemstone additions. Very distinctive approach to trees of life. Like her work, thanks for introducing her. The yellow moon tree pendant is GORGEOUS. They're all incredible, though. Really elegant. My old house has a lot of trees and grapevines. One winter night I remember looking up to see the moon peek out amongst the vines and bare branches. It was one of those images that stick with you for life. Somehow Shannon captures it in jewelry, amazing! These pendants are really neat. 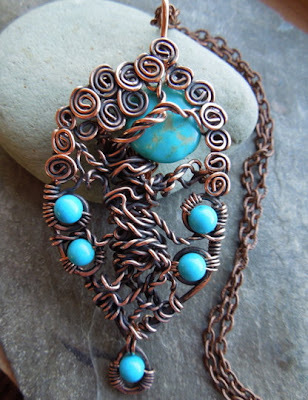 I love how the artist bends and twists the wire and includes gemstones. These pendants are really neat. 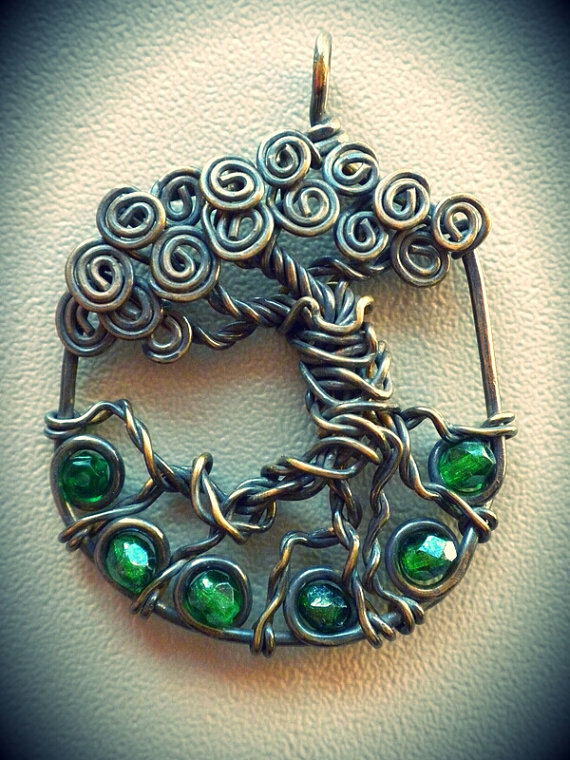 I love how the artist creates twisting and flowing branches with the wire and how she includes gems. I'm subscribed to your blog and really enjoy it! I google + it too. (My first time doing that!). I love Vixen's jewelry! I really want the sea opal one, it's amazing! This is the most wonderful tree of life artist that I have ever encountered. The stones are such an amazing addition. I admire her work and get inspiration from it. Love your tree's. They are so beautiful. thanks. Absolutely beautiful! I want to attempt making a tree of life pendant but I am sure it will not turn out as well as yours. These trees are beautiful and it is hard to pick a favorite. I really do love the forest with Amber, and would love to win one! Beautiful, especially the forest w/ amber sun. I'm a FB fan & email subscriber to your wonderful blog. These are absolutely stunning. Quite the inspiration! Those are so inspiring! The are simple yet complex at the same time. Love it! These are amazing, I love them. Thank you for the chance to win. I'm already a FB Fan as well. I love all your creations, Shannon. I get your newsletter and also like you on Facebook. So glad to read your story on your "Tree of Life "
Wow, these are stunning! (I see I'm not the first to say that, but it's worth repeating.) I'm an email subscriber, a FB follower, and follow you from 2 Twitter accounts. This is one of the BEST Tree of Life versions I've seen. Absolutely beautiful! These are absolutely gorgeous. They are no so easy to make as I have made one myself. Love following this blog. Shared and a must have for handmade jewelry collectors! I've made several Tree of Life Pendants but I love these designs, especially with the moon or sun showing behind the tree. It's truly art. I haven't figured out how to make one with the moon so I just make the trees. These are beautiful. These are gorgeouse I would love to win one! Keeping my fingers crossed for this snowflake moon design, really OOAK. This is amazing!! I like the amber and moonlight much!!!! Those pieces are absolutely amazing! I am also a blog follower and a Facebook fan. By far she has the best designs and I thought I made them pretty good!I would love to win one of hers! I absolutely love her work! Being relatively new to jewelry design, I find these creations awe inspiring and terrifying at the same time. Stunning! OOAK, keeping my fingers crossed, thank you. They are stunning. Wish I could win. I'm a blog subscriber. Everything is so pretty!! The Yellow Moon and the Blue Moon are my favorite! Absolutely gorgeous work! 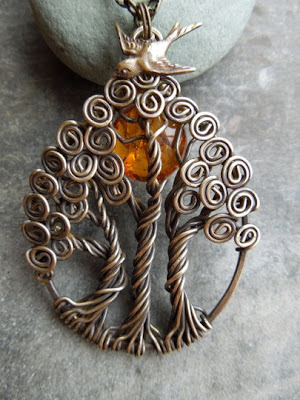 I LOVE the amber sun and forest with the bird charm -- stunning! I am a subscriber and follow you on Facebook and Pinterest, too. Thanks for the opportunity to win! I'd love to win one of these stunning pendants! Nice to know there is so much behind these pendents for her. Probably why they are so good! I am stunned. I have always been drawn to the trees but these are incredible. I love that Ancient Goddess Tree. I am wanting to learn how to make a tree of life and just put it in Bing and your page was the first and WOW what beautiful trees. I am just a beginner at wire wrapping and I had no idea that such beautiful trees could be made. You are so talented! WOW! I cannot believe the beauty of these! Simply stunning! These creations are gorgeous!!!! I also make jewelry and I am thinking about trying to make a Tree of Life pendant for my mother in law. I taught myself how to wire wrap loose uncut semi precious stones and am nervous about starting this new jewelry adventure. It would be a wonderful honor to have a wire sculpture to give me hope. You are welcome to reach me at Shana.grassi@gmail.com.